Both of these new columns will always show gross P&L, regardless of the P&L setting. If you switch to net mode, their column titles will change to emphasize they are still gross. We’ve also added totals and averages for the Commission and “Commission and Fees” columns, at the bottom of the Trades View. 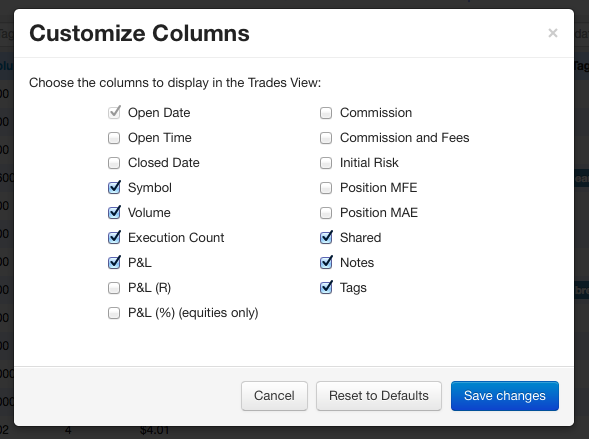 Ever since Tradervue was first released, folks have been sending us email asking for certain columns to be added to the Trades View. We couldn’t add all the columns people asked for, as there wouldn’t be enough room on the page for them all. Clicking “Save changes” will save your new columns, or you can click “Reset to Defaults” to get back to the original columns. Some of these columns are only available for silver or gold subscribers. As part of this change, we’ve also moved the links to change P&L gross/net display mode, and the download to Excel link, into the menu. 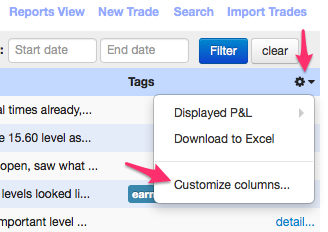 If there are more columns you’d like to see made available, let us know!